This week I travelled through Wisconsin and Colorado visiting some American high schools looking for inspiration on the scheduling question. We first turned our attention to flex-mod scheduling, which is run at several public schools in Wisconsin. Wasau West High, for example, has been using flex-mod for over four decades. Here are a few thoughts from our visits to Wasau West and other schools with this schedule. Last semester the scheduling group I work with did a briefer on flex-mod (scroll through it to right), so we’ll start with the assumption that you have read it. Even after the research, though, I did have a few questions about the implementation of the schedule model. If you’ve been to a university in the U.S. or Canada you’ll find the flex-mod schedule quite familiar, and indeed a flex-mod schedule bears a larger resemblance to a flexible university schedule than a traditional fixed-period high school bell schedule. However, university students (at least at UBC) take 5 classes for 15 hours per week, while ASFM students take 7 classes for 27 hours per week. Universities also usually have much larger student and faculty populations and a variety of facilities than high schools such as ASFM. These differences place much higher constraints on high schools trying to schedule teachers, students and facilities; indeed, I couldn’t figure out how it could be done without generating horrendous numbers of student conflicts or being effectively reduced to a fixed-bell system. It turns out that flex-mod high school schedules have to upturn a few assumptions we have of fixed-period bell schedules in order to gain the flexibility required for the system to work. First, they do allow conflicts between two classes on a student schedule. We alluded to this above, but didn’t have a sense of how common they were in student schedules or how they were specifically dealt with. They are quite common at the schools we visited, and most students have one or more conflicts. One of the schools we visited had a policy of disallowing more than one student conflict per day; however, the others were more lenient and sometimes allowed more than one per day. The schools also had varying ways of dealing with conflicts between two classes. In one school, students attended a “conflict resolution fair” where they would go between teachers in the school gym, trying to negotiate a personalized resolution. According to the school, this usually meant that a student would attend the core subject while leaving early or arriving late to the elective subject. Another school had a simpler policy that the student would split the conflict, leaving slightly early from one class and arriving slightly late at another. Second, to increase the flexibility of student schedules, students do not have one teacher per subject. Imagine a student in a math course taught by three teachers, each of whom teach one large group, two medium size groups and six small discussion groups. Our student is scheduled into Mr. A’s large group. If they must also be in Mr. A’s medium and small groups, they only have two options for the former and six for the latter; however, if they can join any of the three teachers’ groups they have six options for the former and 18 for the latter, vastly improving the choice and increasing the chance that one of those options will fit with the rest of their schedule. Once we accept that this is structurally necessary in a flex-mod schedule, we can see that it may benefit teaching at the school. It means that all teachers on a course need to collaborate and coordinate their teaching, not just on assessments but on day-to-day activities to provide a seamless learning experience for students moving among different teachers. Teacher collaboration has been linked with increased student performance, and this is the type of “must-do” collaboration that will be incorporated into teacher’s daily routines, rather than being an idea promoted by admin and gradually dying off as teachers resort back to old habits. It also means that the school can collect reliable course-wide data from its summative assessments; one school we visited only realized after implementing flex-mod that their freshmen were under-performing in English. 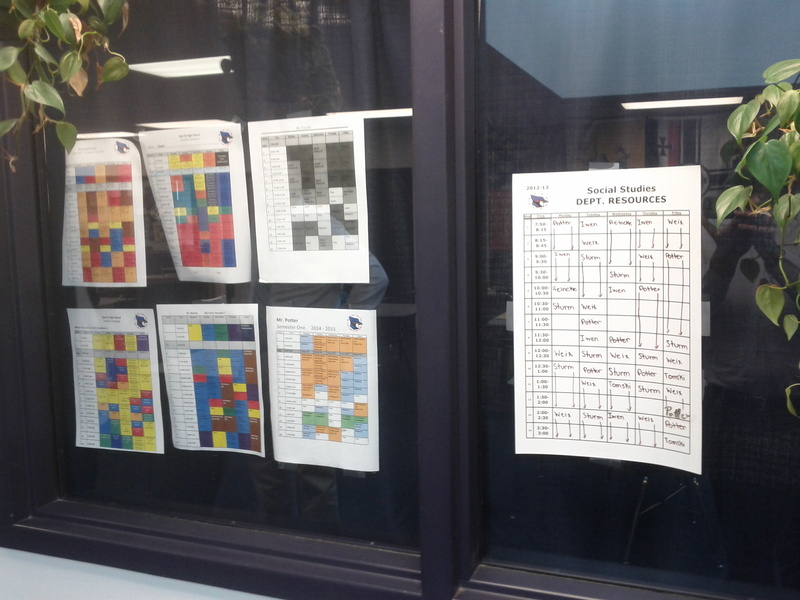 Teacher supervision schedules posted in a resource room in Merrill. Third, classes must give up some instructional time. Again, this is necessary to provide the flexibility to build student schedules with as few conflicts as possible, but it is also a major shift in thinking regarding student work. Currently, teachers build student work time into their class periods. Under a flex-mod schedule, class time is intended to be dedicated to instructional activities rather than practice work. Students then use their unscheduled time during the school day (called “unstructured time” at one school or “resource time” at another) to practice, in a setting where they prioritize and determine what they need to work on, but have teachers present for support. All three flex-mod schools we visited had Resource Centres for each subject, staffed by teachers from that department all day. Students signed into these Resource Centre in their unscheduled time, getting access to teachers during the school day and having much more autonomy than under a fixed-bell structure. I hope not to give the impression that I’m cold on flex-mod. I’m realistic to the challenges that accompany such a drastic schedule change: a change in teacher mentality from “my students” to “our students”, an acceptance of giving up instructional time to student directed time, and making time in teacher schedules to staff resource rooms, for example. That said, if a school is serious about promoting student autonomy, allowing students to access teachers in school, and creating course structures based on how the course should be run and not what the bells allow, then these challenges can be overcome. At the very first school we visited, in Sheboygan, WI, an administrator made the point that it wasn’t the schedule that increased student achievement, it was things the schedule allowed for that did. In ASFM’s traditional 7-period system, there’s little time in the school day for interventions or other deviation from the set curriculum; flex-mod could fix that. I’ll have another post up soon about how to understand flex-mod schedules, as well as some writing about block scheduling.